Starting with looks and you can’t fault the Eric Clapton Stratocaster. There’s no in-your-face design or eccentric custom graphic on this one, just unadulterated Strat style. The timeless 25.5” scale length double-cutaway body is made from solid alder and comes finished in a shiny urethane with a palette of simple color choices, including black, Torino Red, and Olympic White. The bolt-on neck has a very vintage feel, as Clapton likes. Made of satin-finished maple, with a maple fretboard (9.5” radius), it sports a soft V shape – similar to the original 50s V shape, but slightly more rounded for contemporary comfort. This also houses 22 vintage-style frets to complete an all-round familiar and comfortable neck, which is endlessly playable. Finally, note that the craftsmanship is near flawless, as we’d insist on, coming in at a hefty price and coming from Fender’s Corona factory. 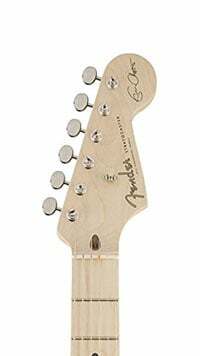 The Eric Clapton Stratocaster sticks with the traditional Strat pickup configuration of three single-coils at the bridge, middle and neck position. These are Fender’s Vintage Noiseless single-coils, which are controlled by a master volume control and two tone pots. The tone controls offer some more complex sound shaping capabilities with one tone control giving you access to the Treble Bass Expander (TBX) tone circuitry, and the other working as an active mid-boost control. Electronics aside, the Eric Clapton Stratocaster is fitted with a great set of Fender chrome sealed tuners along with a genuine bone nut, while the vintage-style tremolo bridge – as specified by Slowhand himself – features a wooden block to keep it from moving, although it’s a simple task to remove this should you wish. On most marketplaces, this great guitar comes with a very stylish vintage tweed case, as well as a strap and a cable. While this signature model won’t turn you into a blues/rock maestro, it does offer the rich, enchanting tone and texture that Clapton is known for. It’s a hugely versatile guitar, with bags of character and soul, and is very well-suited for all kinds of rock and blues (well, what did you expect!). Also, while a little fiddling around is needed, the mid-boost and the TBX are great features to have on stage and can provide a little extra dirt for solos – which is pretty much what you’ll want to being doing on this beauty! Naturally, big fans of Eric Clapton will snap up this guitar with no further encouragement. 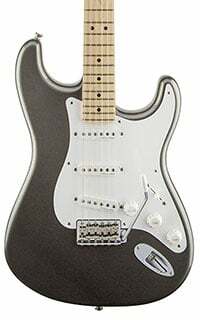 But even if Clapton isn’t your idol, all guitarists can appreciate the uncluttered style, the huge playability, the versatility and the stunning tone of this high-end Fender. 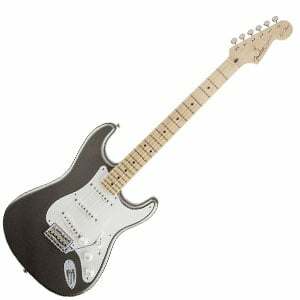 For more info about the Fender Eric Clapton Stratocaster, click here.